A classic that dates back to 1972. 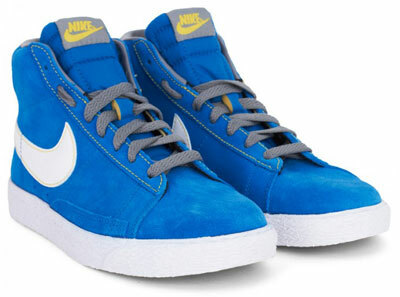 So it’s fair to say that the Nike Blazer Mid trainers for kids are unlikely to show their age anytime soon. That’s because this hi-top looks good and is extremely comfortable too. The version here is obviously a miniature version, but they have all the features of the larger version, as well as a blue suede upper, yellow top stitching, oversized logo and a chunky gum sole. Sizes range from 10 through to 2, with the price at £38.